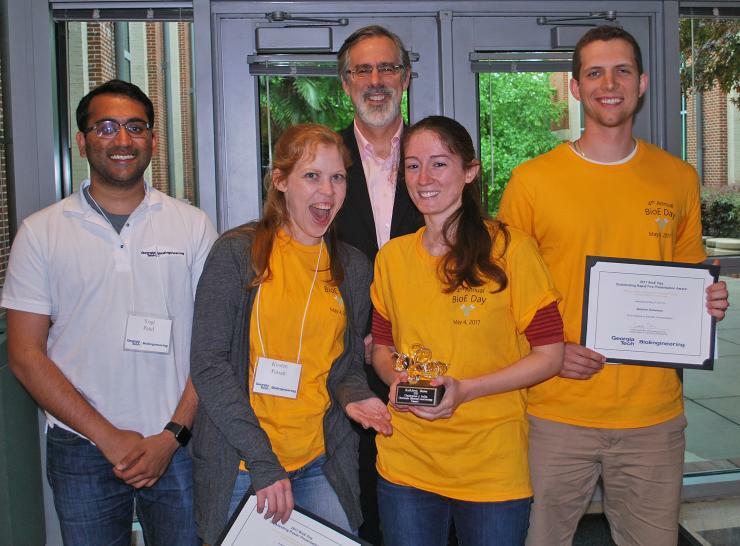 BioE award winners are (left to right) Yogi Patel, Kirsten Parratt, Ross Ethier, Kathleen Bates, and Stephen Schwaner. 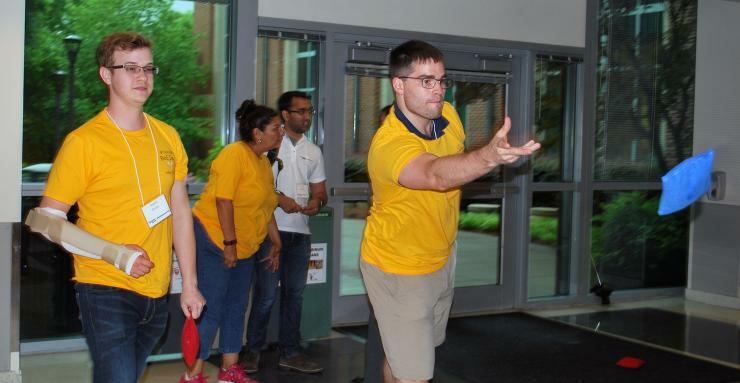 BioEngineering (BioE) Day was greeted by threatening skies that eventually emptied themselves all over Atlanta, but the downpour couldn’t dampen the spirits of the bioengineering students, faculty, and staff who took part in the fourth annual event. Taking the fun inside the Petit Institute Biotechnology building (the BioE program’s headquarters), Georgia Tech’s community of bioengineering graduate students assembled to fete themselves, as they have near the end of each spring semester since 2014. 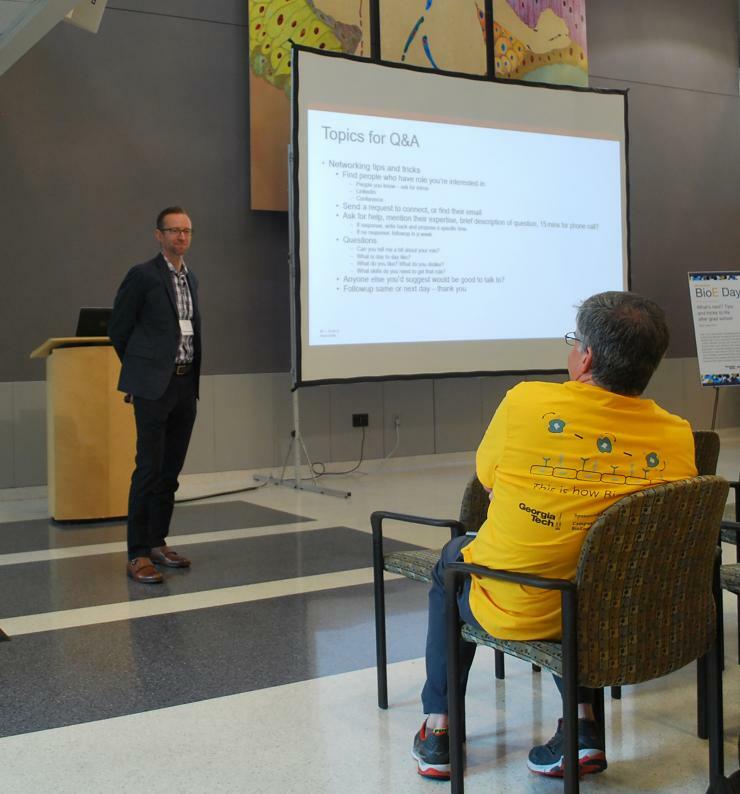 This year’s indoor celebration included a keynote speech, rapid fire presentations, a poster session, and convivial gatherings over lunch, supper, and games. But, as in previous years, the climactic moment of BioE Day was the presentation of awards, particularly the Chris Ruffin Student Leadership Award, named for the longtime, former academic advisor for the BioE graduate program. This year’s winner is Kathleen Bates, a graduate student since 2012, who is based in the School of Chemical and Biomolecular Engineering (ChBE). “She embodies the type of leadership that makes the program proud and would have made Chris Ruffin smile,” wrote Hang Lu, ChBE professor and Bates’ advisor, in her nomination letter. The Ruffin Award is given to a student whose influence, ideals, and activities leave a lasting and positive impression, raising the bar for future BioE classes. The qualities considered are strong leadership and community-based activities, such as peer mentoring, teaching, and service. All of which makes the down-to-earth Bates a perfect choice for 2017. In addition to serving as the research chair for the Bioscience and Bioengineering Unified Graduate Students (BBUGS), she has been the social chair for BioE students and previously was professional development chair for BBUGS. She’s been a mentor in the Petit Undergraduate Scholars program and has also mentored several other undergrads and high school students (in the Project ENGAGES program, while demonstrating steady leadership skills in Lu’s lab). Other BioE awards were given for Outstanding Student Paper (Yogi Patel), Outstanding Poster (Kirsten Parratt), Outstanding Rapid Fire Presentation (Stephen Schwaner), and Outstanding Faculty Advisor (Ross Ethier, professor and interim chair in the Wallace H. Coulter Department of Biomedical Engineering). Sean Coyer led off the day’s activities with a keynote speech that offered tips and tricks for life after grad school. Coyer was a former student of Andrés García, director of the BioE program, researcher in the Petit Institute for Bioengineering and Bioscience, and professor in the Woodruff School of Mechanical Engineering. Coyer’s post-grad school path has led him to W.L. Gore & Associates, where he’s product development director. While Coyer’s presentation offered intentional, helpful advice to the grad students assembled in the Petit Institute atrium, Ethier’s address as BioE’s top faculty advisor for 2017 took a slightly different direction, but was no less inspirational. • Take advantage of interesting opportunities. • Do something that helps people. • It’s all about people you work with. • Do something you are passionate about. • Be a force for good – despite all that is happening. • Your most important asset is your reputation. • Don’t stay in your comfort zone. • Hire the best people and let them do their thing. The implication was that a lot of the best people were sitting right there in the room already, including Bates, the Ruffin Award Winner, whose quiet leadership has made an impact in Georgia Tech’s bio-community. BioE Day keynote speaker Sean Coyer takes a question from his former Ph.D. advisor, Andrés J. García. BioE students let the games begin.